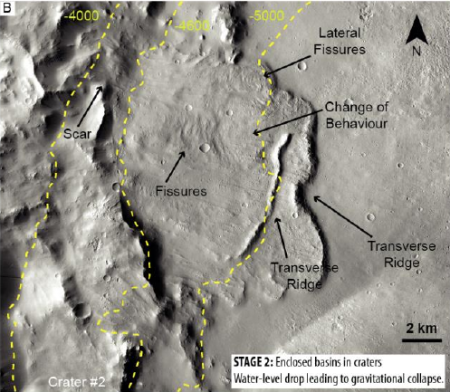 These observations suggest that only the deepest basins, those with floors deeper than -4000m below the Mars datum, intercepted this deep water-saturated zone. Furthermore, they point towards the existence of a planet-wide groundwater table between -4000m and -5000m during the past Martian history. This evidence fully or partially supports the models proposed by Andrews-Hanna and Lewis ; Michalski et al. , which predicted regional to global groundwater upwelling and the existence of a water saturated zone around -4000m below Mars datum respectively. 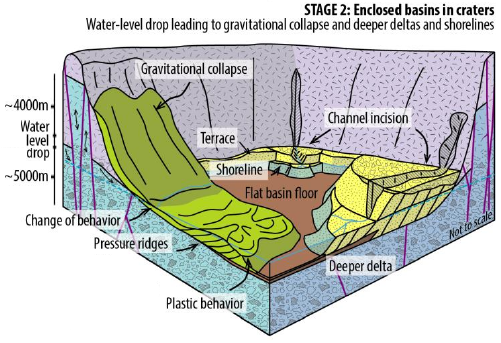 Basins with bases deeper than -4000m below Mars datum intercepted the water-saturated zone were predicted by the model of Michalski et al. and exhibit evidence of groundwater fluctuations. The highlighted quotes illustrate three important facts about Mars’s water history. First, it apparently did have a period when water was stable at the lower elevations of the surface. Second, the elevation for that stable water level varied over time. The image to the right, from the paper, illustrates this change in water level over time. As the water level dropped, it was no longer there to provide support and buoyancy for the cliffs on its edges, and they collapsed, producing the long avalanche tongues we see frequently on Mars, such as with this image. These features fit well with past theories about the existence of an intermittent ocean, as well as the fact that though research has found ample evidence of a shoreline, the evidence has also not found a single shoreline everywhere, as you would expect if the ocean was big and long-lived. Instead the evidence suggests areas of intermittent wetness, some large, some small, some deep, some shallow, all producing shorelines at varying heights as this wetness mostly receded. The third take-away from this paper however is possibly the most important. The evidence suggests that this deep groundwater water table (as ice) almost certainly still exists at all latitudes, though almost entirely underground. From a future explorer’s perspective, this data reinforces the possibility that water will be accessible across much of the Martian surface. All you will have to do is dig a well, something humans have been doing on Earth for eons.